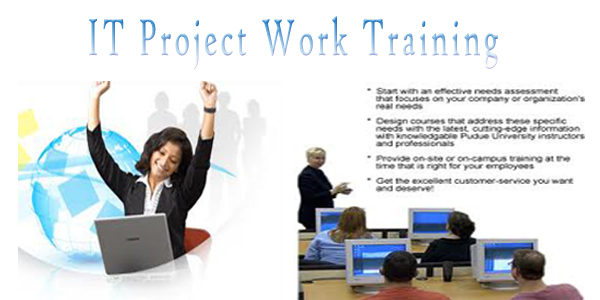 IT Project Work (TRAINING): We are delighted to introduce A2Z Computex, Placement consultancy, Software & Web development, and AMC provider organization which also strengthens area like IT Project Work. We believe that there is always a thirst for knowledge, the more we acquire, the more we enhance, and the greater we feel the need for it. In this present era of liberalization and globalization, where an individual would like to develop his career and move forward in life.A2Z Computex excels in training the candidates to the professional level and also gives them exposure to the live projects which are at par with industry standards and helps in improving the proficiency of individuals by imparting detailed knowledge to them. Once these individuals are trained they are ready for job opportunities in diverse fields. We enhance the skills of the individual. Those individuals who have an open mind to learning and to fine hone their hard & soft skills. We keep students focus on their future vision and have clarity about what they are learning. We see that the students are able to integrate their vision with our curriculum. At A2Z Computex we make Project more objective so that the efficiency for employability increases on the continued basis. A2Z Computex is committed to provide high quality Project, education, training and expertise to enhance the intrinsic abilities of the students. We Provide IT Project Support For B.E, B. Tech, And Polytechnic Diploma (IT) Students: Are you near to complete your BE (Computer Application, Electronics)/B.Tech (Computer Application, Electronics)/MCA (Master in Computer Application) Course, and yet have not done your project in the lack of efficiency? Come to A2Z Computex and complete your project work with working our professionals in the industrial environment and under the experts' guidance. Here, our experienced and highly skilled professionals will guide you in all ways, whenever and wherever you require. Under our proficient guidance, you will not only compete your MCA project successfully, but also pave your way to be a successfully software professional in the future. A2Z Computex has the experts of all streams of computers and all of them have long experience in the industry. That's why, they can solve very complex problems in the blink of eyes. A2Z Computex is a software firm that has launched this service to fulfill the requirements thousands of engineering students in the North India. Viewing the requirement of the students, A2Z Computex is offer live project training on all major language and software including Java, C, C++, C#, .Net, ASP, VB.NET, JSP, Servlets, Struts, Ajax, PHP, MySQL, HTML, XML, J2ME, J2EE, J2SE and Objective C. The opening for B.E/B.Tech/MCA project is always open and any final year student can join A2Z Computex as a trainee for completing projects. Certification provide by A2Z Computex.